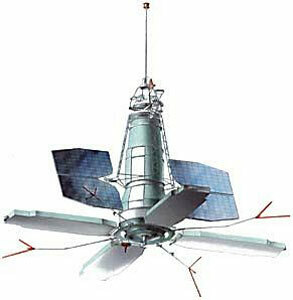 Artist’s conception of a Tselina-R satellite (Credit: Yuzhnoye). There is a family of satellites in Earth orbit with a remarkable cross-shape when viewed at high magnifications. The cruciform of these satellites is caused by four characteristic panels pointing directly to the Earth. This is the family of Tselina-D spacecraft, belonging to the Soviet ELINT (Electronic and Signals Intelligence) satellite class, launched from the Plesetsk cosmodrome (USSR). The Tselina’s, built by Yuzhnoye, consisted of two satellite-types: Tselina-O for general observations and Tselina-D for detailed observations. Both systems worked together, which means that radio targets found by the smaller Tselina-O were observed in more detail by the Tselina-D version. Tselina-D satellites were operated in six orbital planes, spaced 30 degrees apart. Development of these satellites started already in the 1960’s while the first launch took place in 1970. Later, the Tselina-O was no longer used, and the Tselina-D was applied for the entire general surveillance, and in the mid-1980’s, the launch of the improved Tselina-2 version began. Considering their age and their replacements, it’s understandable that Tselina-D’ s are no longer in use, so they could be considered as space junk. In June 2011, I had some favorable passes of a Tselina-D, (type 1), namely Cosmos 1626, which was launched in January 1985. At that time, there were already launches of the type 2 (Tselina-2). 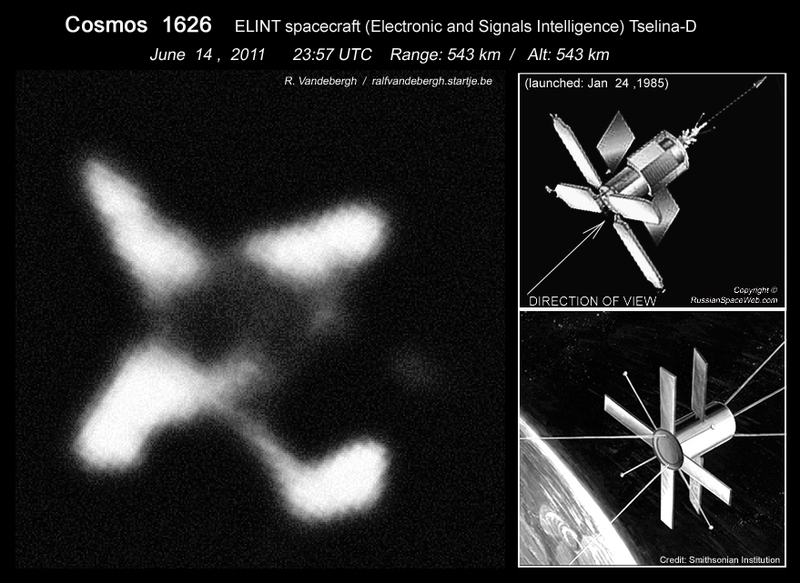 The images taken on June 14, 2011 provide an amazingly clear view of the satellite and its panels in cross-shaped configuration. It appears we look at it from just a slightly shifted angle. The spacecraft passed 88 degrees overhead, enabling to capture it at almost closest distance of 543 kilometers, the altitude of the spacecraft above the ground. Interesting is the shape of the 4 main panels we see. We also recognize some other interesting details, like the dark structures at the intersection of the panels and some kind of shade, but the exact attitude of the satellite it is not clear is in these pictures, obtained with a 10 inch aperture reflecting telescope. This is an older image from the military of a Tselina (second generation ELINT) showing nearly the same cruciform view. The position of Cosmos 1626 can be tracked. 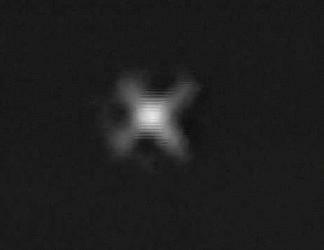 Look also the similar high-resolution images of Nanosail-D.
Nice article and image, Ralf. The detail is unmistakable due to the cruciform pattern.